Description Buzz Towing service company offers a full range of towing and roadside services that are best suited for scenarios that occur along the highway today. Accidents are happening every day and tow companies are out there clearing the cars and getting people back on the road. 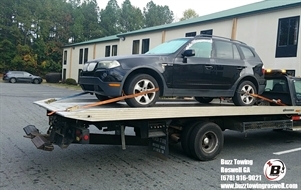 Having a towing company like Buzz Towing company that’s able to serve the community when they need it the most, adds value to the citizens and quality of life in the local area. Larger cities like Roswell GA, often have rush hour traffic that can give you gray hairs and accidents happen causing even more delays. When those cities have effective tow companies like Buzz Towing, servicing their city it can turn a nightmare into a well-handled situation. We can save the day and not make you spend the day in your car waiting in traffic or unfortunately if you are a victim in the accident spending hours waiting alongside the highway. Add Buzz Towing to your free online travel itinerary.